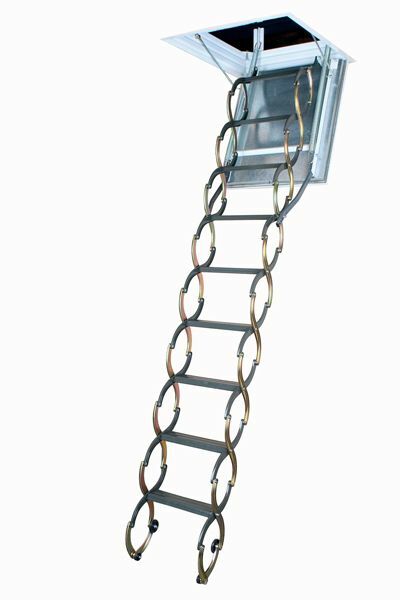 The high-quality LSF is a powder-painted, scissor, fire-rated attic ladder assembled from metal links. The LSF provides easy access to the ladder while functioning as a blaze block in case of fire. The hatch is manufactured with the use of fireproof materials and is equipped with a gasket that expands under extreme heat. The LSF ladder is fire-resistant at EI260 minutes as per EN 13501-2. It is equipped with locking mechanism that is installed inside insulated and sealed door panel. Construction of ladder provides more steps (tread rise about 10 in.) to improve safety and comfort. Can add up to 1 additional step to bring ladder height to 10ft. 6in. Springs run parallel with door to make entry to attic wider and more comfortable (the widest entrance on market - compare to other products). Door is well balanced - it opens and closes easily (NO sudden movements). Fits rough opening 22 1/2 in. x 47 in. and ceiling heights 7 ft. 10 1/2 in. to 9 ft. 10 in. 1 1/8in insulation thickness sandwiched inside 2 1/8 in. thick door. Sealed with rubber gasket. Attic Ladder (Scissor Fireproof Door Insulated) LSF 22 1/2 x 47 300lbs 9ft 10in The high-quality LSF is a powder-painted, scissor, fire-rated attic ladder assembled from metal links. The LSF provides easy access to the ladder while functioning as a blaze block in case of fire. The hatch is manufactured with the use of fireproof materials and is equipped with a gasket that expands under extreme heat. The LSF ladder is fire-resistant at EI260 minutes as per EN 13501-2. It is equipped with locking mechanism that is installed inside insulated and sealed door panel. Construction of ladder provides more steps (tread rise about 10 in.) to improve safety and comfort. Can add up to 1 additional step to bring ladder height to 10ft. 6in. Springs run parallel with door to make entry to attic wider and more comfortable (the widest entrance on market - compare to other products). Door is well balanced - it opens and closes easily (NO sudden movements). Fits rough opening 22 1/2 in. x 47 in. and ceiling heights 7 ft. 10 1/2 in. to 9 ft. 10 in. Attic Ladder (Scissor Fireproof Door Insulated) LSF 22 1/2 x 47 300lbs 9ft 10in is rated 5.0 out of 5 by 2. Rated 5 out of 5 by Chris312 from Great ladder for the attic The ladder and unit are solidly built, and the door is insulated. The metal scissor ladder is sturdy and works well. The included reach bar for the door opening and ladder makes using the unit a breeze. Now I can access the attic by myself with a huge ladder. I would buy this again and recommend it to anyone who needs an attic ladder that fits this size unit.